For those that would like to test out their art skills, here's an assignment. 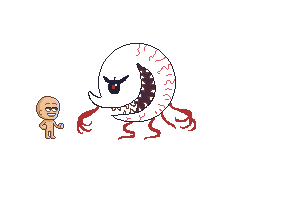 A giant eyeball with arms and legs. Must be within a canvas that is 50px by 50px. Don't worry about the palette of colors. Just be creative. Thank you for your submission (if we even get any)! 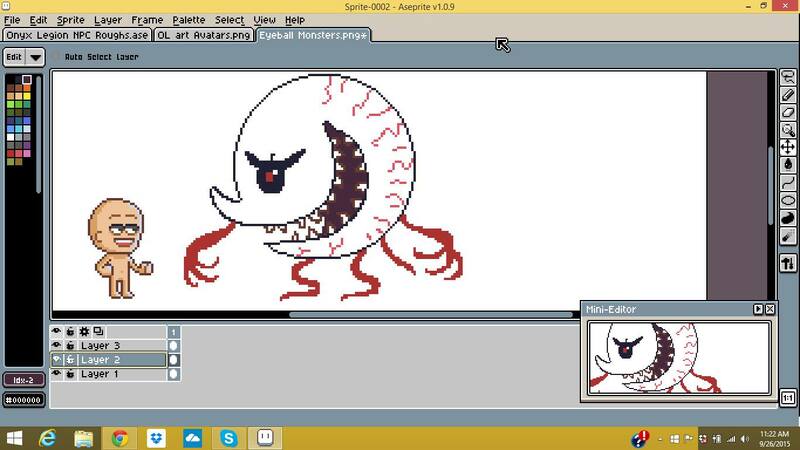 It is the Unimpresed Eye Monster. It can lurk everywhere where it doesn't want to be itselfe. Shaming itselfe into the ground for existing. It's very cute. Thank you for participating! I enjoy your description about the eyeball. I am quite surprised to get that positive feedback since I didn't even took real effort into this and it was mainly meant as troll pic just to be the first one who contribute anything to hopefully make some laughs and motivate others to beat this 'horrible' gimmec (since people would feel less ashamed to post something not-flawlessy if they see something like my draw-in-7-minute-eye as existing post on the top of the page. Well, actually I would say that I am horrible in drawing something living. If anything, then I would rather say that I can do items or constructs. You probably would have done better to just say thank you. Pogo you should give something a try then. There's an infinite amount of things that fit the non-living category (like buildings, trees, quest objects, items....). Anything is worth a shot! Jazy, this is a fantastic piece that will make it into the game. Thanks for the contribution. How do I put my pic on this forum? then click 'send', then copy the one that you like and paste it into this post field. The problem with your image posting is that you're trying to add the website URL in the image tags, appose to the actual image link itself. If you go to the page where your image is and right click the image and click "Copy image URL", you'll then have the actual image URL (https://i.imgur.com/qfjitn5.png) in your clipboard and will be able to paste it into image tags.